We also discovered a really interesting and useful glitch. On the surface, the Memory Rhythm SR88 only offers those four sounds – kick, snare, crash and hats. But when you’re programming in step time, something odd happens in the SR88’s little brain and the sounds loop indefinitely for as long as you hold down the buttons on the box. The short hat sound becomes an extended hiss, and the crash cymbal and snare go on as long as you want them to. That seemed too good to miss, so we sampled those sounds too, again through the whole travel of the tone control, and called them snare 2, crash 2, and hats 2 and 3. 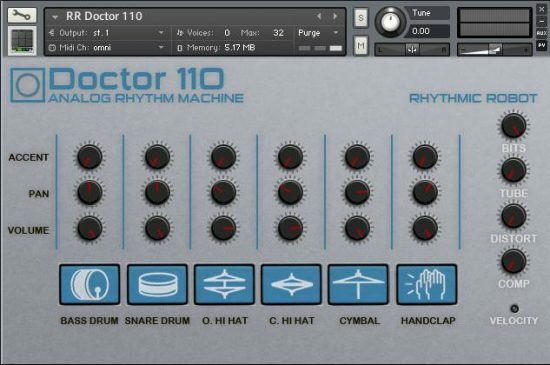 We gave each of these “hidden extra” sounds an Attack and Decay parameter, so you can get “brushed cymbal” effects, or back off the attack transient of the snare, or get that 80s-style snare with a huge decay tail, or reversed cymbal effects… it opens up a lot of new possibilities! There are also Pitch, Pan and Level controls for each individual kit piece, so you can balance them against each other. On the original box, sometimes getting the kick sounding right meant that the hats would take your head off; this way is much better! 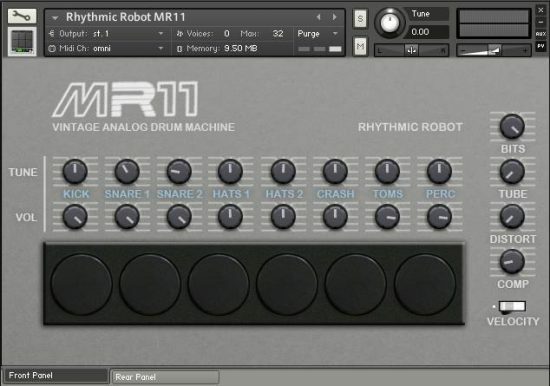 Rounding things out is a comprehensive drums-based Processing section, offering bit-rate reduction (not an analogue thing, of course, but useful to have in the arsenal nevertheless), tape saturation, drive distortion, and a chunky compressor to lock everything together. 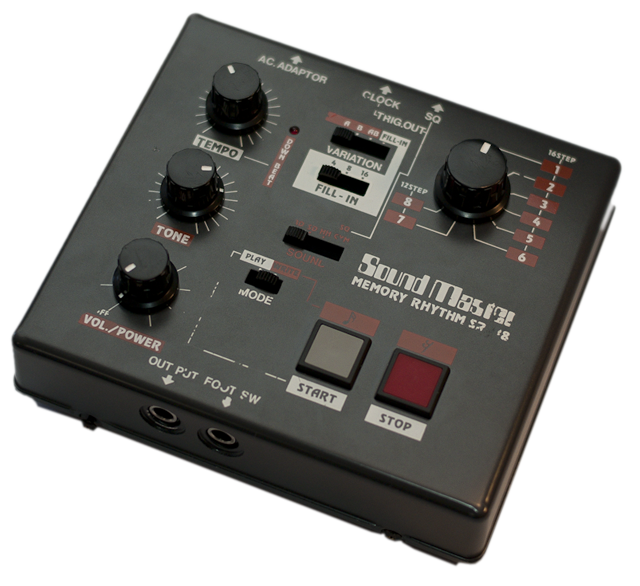 Finally, hidden in the corner is a “Velocity retrofit” switch, which allows you to control the Tone of each kit piece not from the knob on the interface but from the velocity of your keyboard – just hit harder to get a brighter sound. 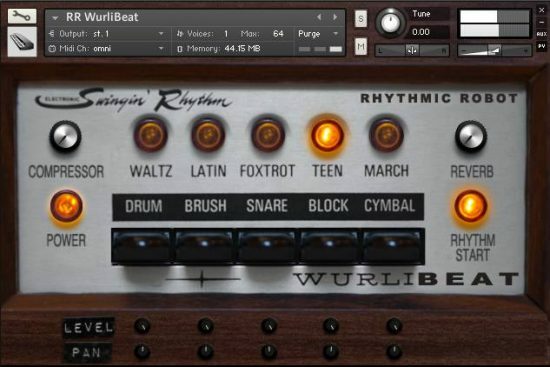 The results can sound absolutely authentic to the 1980s original, or pumpingly grungy in a truly modern way, or anything in between, with a tone that can be locked in place by the panel controls or vary freely with the expression of your playing. I had one of these, or a very close cousin of this (mine was blue), back in the 80s. I have to tell you, I hated the pock-tick pock-tick. I wanted, but did not have, a real drummer. 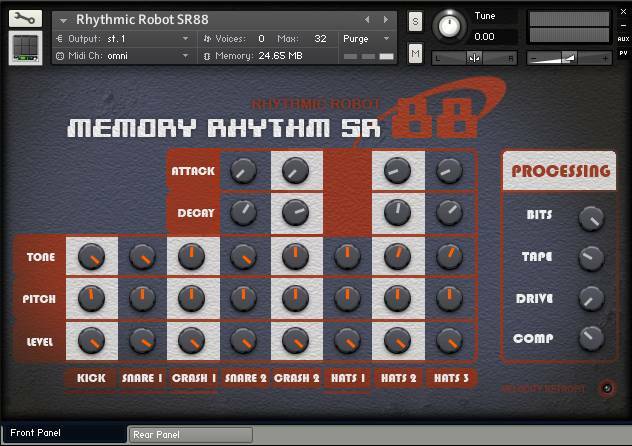 I’ve bought a bunch of Rhythmic Robot instruments, though, and every time I’d go to their site I stopped by and looked at the SR88. I guess I’m sentimental. I finally was buying a few other things and broke down. Well, there’s still that sound, but it’s a hell of a lot easier to program. And if you fiddle around with all those dials on the right (comp, bits, drive, tape) it sounds more like POCK! TICK! If you miss your old SR88 you can’t find a better recreation. 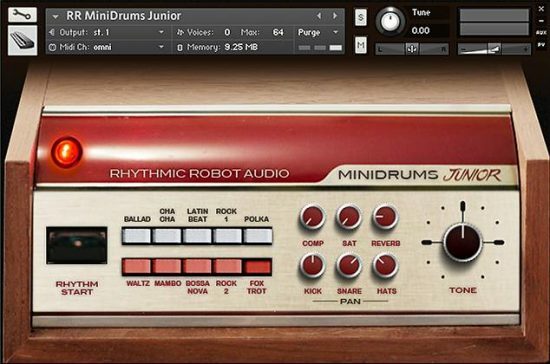 It won’t be my go-to drum machine emulation, but when I want an SR88, or use it as an auxilliary rhythm instrument, it’s right there. 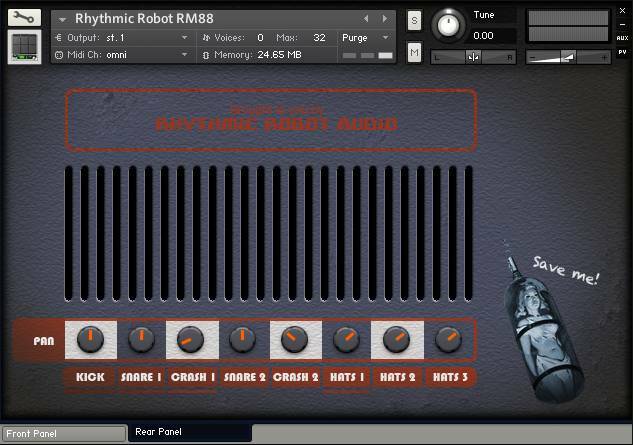 Sounds just like the original,rhythmic robot does it again,works flawlessly in kontakt!